In statistics collected by The ESA for the year 2013, a reported 58% of Americans play video games and the average American household now owns at least one dedicated game console, PC or smartphone. The households that own these items play games most commonly on their Console or PC. 36% of U.S. gamers play on their smart phones. 43% of Video game consumers believe games give them the most value for their money compared to other common forms of entertainment such as movies, or music. In 2011, the average American gamer spent an average of 13 hours per week playing video games. In 2013, almost half of Americans who were gaming more than they did in 2010 spent less time playing board games, watching TV, going to the movies, and watching movies at home. When Americans game, 62% do so with others online or in person yet the other person is more likely to be a friend than a significant other or family member. The most common reason parents play video games with their children is as a fun family activity, or because they are asked to. 52% of parents believe video games are a positive part of their child's life and 71% of parents with children under 18 see gaming as beneficial to mental stimulation or education. The average age of a U.S. gamer is 35, the average number of years a U.S. gamer has been playing games is 13, and only 29% of the gamer population is under 18 years old. The American gamer population is 59% male and 41% female. Of those females, women 18 and older account for a greater portion of the population than males younger than 18. The average female video game player is 37 years old, while the average male video game player is 33. The bestselling console video game genres of 2012 were Action, Shooters, and Sports.The PC gaming market's bestselling genres were Role-playing, Strategy, and Casual. For online games the most popular genres are Puzzle/trivia, action/strategy, and casual/social games. While there are many American video game developers that have been producing games for years, Japanese games and companies have regularly been listed in the annual lists of best sellers. The U.S. computer and video game dollar sales growth of 2012 was 14.8 billion dollars, showing a drop of 1.6 billion from the year before. The Unit sales growth featured a similar drop with the report of 188 million units sold from 245.9 in 2011. U.S gaming consumers spent a total of $20.77 billion on the game industry alone and currently hard copies of video games are still dominating in sales compared to digital copies . The beginning of video games can be traced to the year 1940, when American nuclear physicist Edward Condon designed a computer capable of playing the traditional game Nim. This device would have tens of thousands of people play it even though the computer won 90% of the time. 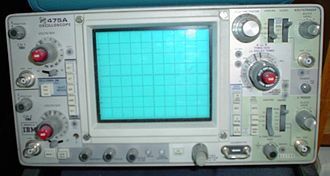 Seven years later an American television pioneer, Thomas T. Goldsmith, Jr., patented an oscilloscope displayed device that challenged players to fire a gun at a target. At the start of the 1950s another American, Claude Shannon, wrote basic guidelines on programming a chess-playing computer. Although OXO was created in England by the year 1952, the findings and inventions of the Americans described helped make it possible. 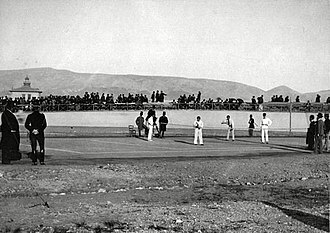 The U.S. military dove into the computer age with the creation of a game titled Hutspiel. 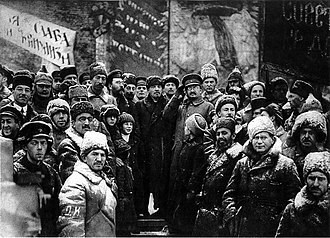 Considered a war game, Hutspiel depicted NATO and Soviet commanders waging war. The IBM 701 computer received programs like Blackjack and Checkers. 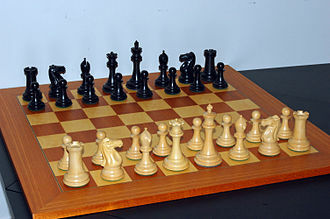 A later IBM model featured a chess program that was capable of evaluating four ply ahead. The '50s also included the largely forgotten tennis game created by Willy Higinbotham that anticipated the famous game Pong. 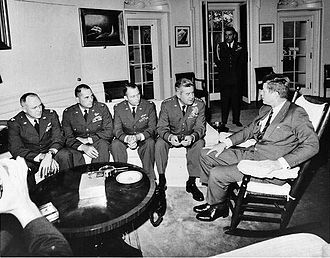 The military continued to take part in video gaming in the 1960s when, shortly after the Cuban Missile Crisis The Defense Department created a war game known as STAGE (Simulation of Total Atomic Global Exchange). 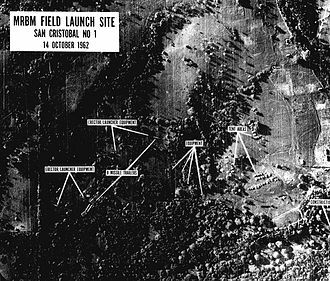 STAGE was created to be political propaganda that showcased how the U.S. would be victorious in a Thermonuclear war with the Soviet Union. The idea of video games that were usable on televisions was conceived by the engineer Ralph Baer and with the help of a team, Baer completed two successful TV games in this decade. The first interactive media computer game, Spacewar eventually had the future founders of Atari create an arcade game of it titled Computer Space that became the first video arcade game ever released. The 1970s included the birth of the video game console. The first console released was titled Magnavox Odyssey and the foundation of Atari occurred around the same time, marking the start of Pong's development. Upon Pong's completion it become the hottest selling Christmas product of 1975. The evolution of the console was incredibly rapid. A few years after their invention, consoles received microprocessors and programmable ROM cartridge based games, allowing users the ability to change games by simply switching cartridges. 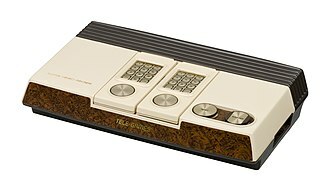 Important consoles released at this time were the Telstar, Fairchild Channel F., and Atari 2600. 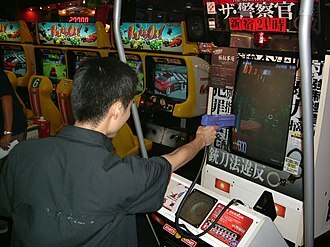 Arcade games also received advances with the game Space Invaders, which allowed high scores to be tracked and displayed. A year later the game Asteroids built on the idea and gave high scorers the ability to enter initials by their scores. The technological advances of the late '70s led to the introduction of the Intellivision in 1980, which featured better video game graphics but a higher price tag. In two years, the Commodore 64 changed the market by not only being the most powerful console of the time but also the cheapest. With the lowered prices, popularity of the video game industry continued to grow and the first video game magazine, Electronic Games, was printed. This decade featured the start of 3D games and the release of the Nintendo Entertainment System, Master System, Game Boy, Sega Genesis, Atari 7800, and the lesser known TurboGrafx-16, which featured games stored on compact discs. This time period was almost considered the second generation of console video gaming in the United States but a massive recession hit the industry from 1983 to 1985. This recession was called the North American video game crash of 1983. The early '90s saw the introduction of the Super NES, Sony PlayStation, Nintendo 64, Tamagotchi, and Dreamcast, whose sales brought the damaged video game industry back to life. During this decade, the PlayStation was considered the most popular console when its 20 millionth unit sold. In 1993, the video game industries' first debate began and its focus was on violence found in video games. This debate fueled Senator Joseph Lieberman's desire to ban all violent games and from this investigation the Entertainment Software Rating Board was created in 1994; giving all games a printed suggested age rating on their packaging. The 2000s brought PlayStation even more popularity when its second console had such a high American consumer demand that it actually affected the console's availability to be purchased during the first few shipments. Microsoft and Nintendo also saw this popularity with the release of their own next generation consoles. Consoles up until this point were controlled by handheld devices called game controllers that featured an assortment of buttons and joysticks. In 2006 a revolutionary system to control games with actual body movements would appear. The popularity and advancement of the video game industry continues to grow in the United States to this day. Within the 2010s, a larger shift towards casual and mobile gaming on smartphones and tablets became significant, in part due to a wider demographic of video game players drawing in more female and older players. Continuing from the previous decade, a large number of independently-developed video games emerged as games on par with those from major publishers, made easier to promote and distribute through digital storefronts on personal computers, consoles, and mobile store markets. All three major console manufacturers released next generation consoles: Xbox One, PlayStation 4, Wii U, and Nintendo Switch. Video game designers are required to have a variety of skills and innate abilities that feature a vast amount of training in computer graphics, animation and software design. On top of these skills a successful designer needs a powerful imagination and knowledge of the various consoles' operating systems. 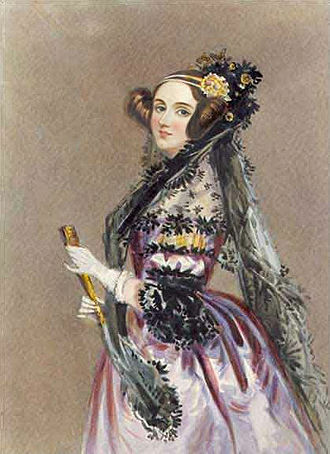 Programming and hardware essentials are a must, considering games are sophisticated computer software. To get into the field many colleges offer classes, certificates, and degrees in computer programming, computer engineering, software development, computer animation, and computer graphics. Internships or apprenticeships are important to get hands on experience. If possible an aspiring American game designer should conduct freelance work. There is even the possibility of designing a game independently, using a wide array of available software. Building an independent game can be risky yet the finished product gives employers insight on what the designer is capable of; just like a portfolio. The U.S. video game industry continues to function as a vital source of employment. Currently, video game companies directly and indirectly employ more than 120,000 people in 34 states. The average compensation for direct employees is $90,000, resulting in total national compensation of $2.9 billion. The current job market for game design in the US is extremely competitive, however it is soon expected to have a 32% increase in software publishing jobs, according to the U.S. Department of Labor. An American game designer salary depends on where the designer works, who they work for, and what kind of designer they are. A good starting place on finding average salaries is International Game Developers Association's entry level salary report that lists $50,000 to $80,000 annually; averaging $57.600. A closer comparison to what a US Game developing job could potentially start at is the Learn Direct's report of $37,000 yearly. 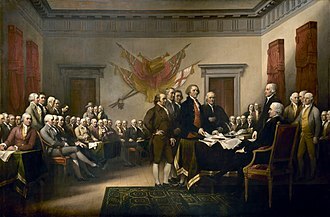 As with most forms of entertainment, video games and video gaming is rife with controversies in the United States. Such controversies primarily target the presence of violence which dominated many early video games and continues to be a major component of many games today. A notable event regarding violence in video games appeared from 1997–1999, during which the state of Arizona attempted to make the selling of violent material to minors illegal. Even though it was never approved, Wal-Mart banned over fifty video games and The Columbine School shooting of 1999 changed the ideas of the debate. Instead of the argument being fixated on morality a new theory was created that tied violent video games to the desensitization and increased aggression of American children. This debate paired with Columbine caused the Sega game company to stop the release of a light gun with the Dreamcast. In 2010 the Court case Schwarzenegger V. Entertainment Merchants Association (now titled Brown v. Entertainment Merchants Association) struck down a recent California law that banned the sale of certain violent video games to children without parental supervision. The Court ruled that video games were protected under the First Amendment of the Constitution, just like other forms of media. Arizona and California are not the only states that have attempted to pass laws on violent video games and these laws have been tested repeatedly in federal courts over the past decade and all have been struck down. Currently 85% of American parents are aware of the ESRB rating system and many are finding parental controls on video game consoles useful. ^ Stephen E. Siwek. "Video Games in the 21st Century: The 2012 Report" (PDF). Theesa.com. Retrieved December 1, 2012. ^ Patrick Rishe (April 18, 2012). "Trends in the Multi-Billion Dollar Video Game Industry: Q/A with Gaming Champ Fatal1ty". Forbes. Retrieved December 1, 2012. 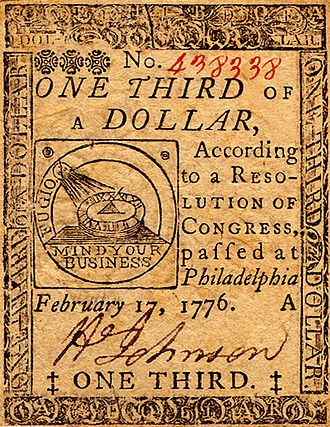 ^ a b c d e f g h i j 2013 Essential Facts about the Computer and Video Game Industry Archived February 17, 2014, at the Wayback Machine. N.p. : Entertainment Software Association, 2013. www.theesa.com. Entertainment Software Association. Web. October 9, 2013. ^ "Time spent gaming on the rise - NPD". GameSpot. Archived from the original on October 23, 2010. Retrieved May 3, 2011. ^ "Wayback Machine" (PDF). 2018-01-12. Retrieved 2018-04-11. ^ Frank, Allegra (2016-04-29). "Take a look at the average American gamer in new survey findings". Polygon. Retrieved 2018-04-11. ^ "Video games that get lost in translation - Technology & science - Games | NBC News". MSNBC. April 28, 2004. Retrieved December 1, 2012. ^ a b c d e f g h i j "Video Game History Timeline." ICHEG. International Center for the History of Electronic Games, n.d. Web. October 10, 2013. ^ a b c d e f g Kudler, Amanda. "Timeline: Video Games. "," "Infoplease", 2007. Retrieved on November 3, 2013. ^ a b c "Video Games On Trial: Part Four -- In Summation, Looking Towards November 2". G4. Retrieved May 3, 2011. ^ Leonov, Ievgen (December 29, 2014). "Mobile and Social Gaming Industry: 2014 Highlights". Gamasutra. Retrieved October 5, 2015. ^ . "Economic Impact", "ESA", 2010, Retrieved on November 3, 2013. ^ ""Software Developers: Job Outlook"." "U.S. Bureau of Labor Statistics", July 18, 2012, Retrieved on November 3, 2013. ^ Cornelius, Doug (November 4, 2010). "Violent Video Games and the Supreme Court". Wired. Retrieved May 3, 2011. ^ Kennedy, Kyle. "A Look At the Renewed National Debate On Violent Video Games." TheLedger.com. Ledger Media Group, July 20, 2013. Web. October 10, 2013. The Sega Master System is a third-generation home video game console that was manufactured by Sega. It was originally released in 1985 as the Sega Mark III in Japan, after being redesigned prior to its North American launch, the console was renamed Master System and released in 1986 in North America,1987 in Europe, and 1989 in Brazil. The redesigned Master System was released in Japan in 1987 with additional features over the overseas models, the Master System featured accessories such as a light gun and 3D glasses which were designed to work with a range of specially coded games. 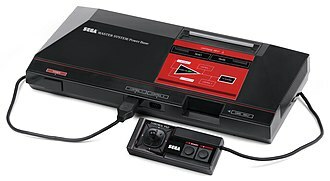 Succeeding the SG-1000, the Master System was released as a competitor to the Nintendo Entertainment System in the third generation of video game consoles. 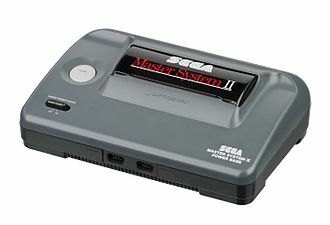 The Master System was constructed with hardware superior to that of the NES, however, it attained significantly more success in Europe and Brazil. The hardware of the Master System shared similarities with Segas handheld game console. 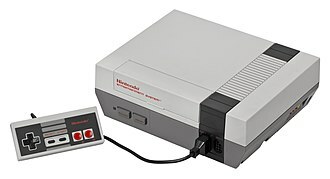 Sales of the console have been estimated between 10 and 13 million units, not including recent Brazil sales, compared to 62 million NES units sold, as of 2015, the Master System is the longest-lived game console, due to its popularity in Brazil. The company retained its Japanese subsidiary, Sega Enterprises, Ltd. as well as Segas North American research, with its arcade business in decline and Western executives turned to Sega Enterprises, Ltd. s president, Hayao Nakayama, for advice on how to proceed. Nakayama received permission to proceed with project, leading to the release of Segas first home video game system. The SG-1000 was first released in Japan on July 15,1983 and it was launched on the same day that Nintendo released the Family Computer in Japan. Nakayama was installed as CEO of the new Sega Enterprises, following the buyout, Sega released another console, the SG-1000 II, for ¥15,000. 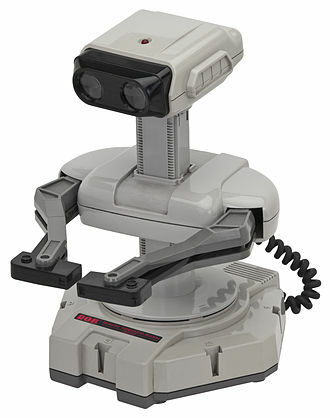 It featured a few hardware tweaks from the model, including detachable controllers. The SG-1000 II did not sell well, leading to Segas decision to work on the video game hardware used for the system. This resulted in the release of the Sega Mark III in Japan in 1985, engineered by the same internal Sega team that had created the SG-1000, the Mark III was a redesigned iteration of the previous console. The Commodore 64, known as the C64, C-64, C=64, or occasionally CBM64 or VIC-64 in Sweden, is an 8-bit home computer introduced in January 1982 by Commodore International. It is listed in the Guinness World Records as the single computer model of all time. Volume production started in early 1982, marketing in August for US$595, preceded by the Commodore VIC-20 and Commodore PET, the C64 took its name from its 64 kilobytes of RAM. It had superior sound and graphical specifications compared to earlier systems such as the Apple II and Atari 800, with multi-color sprites. The C64 dominated the low-end computer market for most of the 1980s. Sam Tramiel, a Atari president and the son of Commodores founder, said in a 1989 interview, When I was at Commodore we were building 400,000 C64s a month for a couple of years. In the UK market, the C64 faced competition from the BBC Micro and the ZX Spectrum, part of the Commodore 64s success was its sale in regular retail stores instead of only electronics and/or computer hobbyist specialty stores. Commodore produced many of its parts in-house to control costs, including custom integrated circuit chips from MOS Technology and it has been compared to the Ford Model T automobile for its role in bringing a new technology to middle-class households via creative and affordable mass-production. Approximately 10,000 commercial software titles have made for the Commodore 64 including development tools, office productivity applications. C64 emulators allow anyone with a computer, or a compatible video game console. The C64 is credited with popularizing the computer demoscene and is used today by some computer hobbyists. In 2008,17 years after it was taken off the market, in January 1981, MOS Technology, Inc. Commodores integrated circuit design subsidiary, initiated a project to design the graphic, Design work for the chips, named MOS Technology VIC-II and MOS Technology SID, was completed in November 1981. Commodore began a game console project that would use the new chips—called the Ultimax or the Commodore MAX Machine and this project was eventually cancelled after just a few machines were manufactured for the Japanese market. A smartphone is a mobile phone with an advanced mobile operating system that combines features of a personal computer operating system with other features useful for mobile or handheld use. Smartphones can access the Internet and can run a variety of third-party software components and they typically have a color display with a graphical user interface that covers more than 76% of the front surface. In 1999, the Japanese firm NTT DoCoMo released the first smartphones to achieve mass adoption within a country, smartphones became widespread in the late 2000s. Most of those produced from 2012 onward have high-speed mobile broadband 4G LTE, motion sensors, in the third quarter of 2012, one billion smartphones were in use worldwide. Global smartphone sales surpassed the sales figures for regular cell phones in early 2013, devices that combined telephony and computing were first conceptualized by Nikola Tesla in 1909 and Theodore Paraskevakos in 1971 and patented in 1974, and were offered for sale beginning in 1993. Paraskevakos was the first to introduce the concepts of intelligence, data processing and they were installed at Peoples Telephone Company in Leesburg and were demonstrated to several telephone companies. 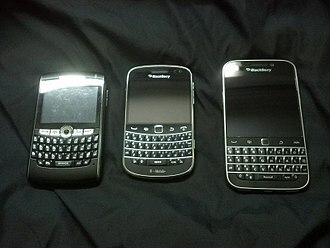 The original and historic working models are still in the possession of Paraskevakos, the first mobile phone to incorporate PDA features was a prototype developed by Frank Canova in 1992 while at IBM and demonstrated that year at the COMDEX computer industry trade show. It included PDA features and other mobile applications such as maps, stock reports. A refined version was marketed to consumers in 1994 by BellSouth under the name Simon Personal Communicator, the Simon was the first commercially available device that could be properly referred to as a smartphone, although it was not called that in 1994. The term smart phone appeared in print as early as 1995, in the mid-late 1990s, many mobile phone users carried a separate dedicated PDA device, running early versions of operating systems such as Palm OS, BlackBerry OS or Windows CE/Pocket PC. These operating systems would evolve into mobile operating systems, in March 1996, Hewlett-Packard released the OmniGo 700LX, a modified HP 200LX palmtop PC that supported a Nokia 2110 phone with ROM-based software to support it. It had a 640×200 resolution CGA compatible four-shade gray-scale LCD screen and could be used to place and receive calls and it was 100% DOS5.0 compatible, allowing it to run thousands of existing software titles, including early versions of Windows. In August 1996, Nokia released the Nokia 9000 Communicator, a cellular phone based on the Nokia 2110 with an integrated PDA based on the PEN/GEOS3.0 operating system from Geoworks. The two components were attached by a hinge in what known as a clamshell design, with the display above. The PDA provided e-mail, address book and notebook applications, text-based Web browsing, when closed, the device could be used as a digital cellular phone. In June 1999 Qualcomm released the pdQ Smartphone, a CDMA digital PCS Smartphone with an integrated Palm PDA, subsequent landmark devices included, The Ericsson R380 by Ericsson Mobile Communications. The Atari 7800 ProSystem, or simply the Atari 7800, is a home video game console officially released by Atari Corporation in 1986. It is almost fully backward-compatible with the Atari 2600, the first console to have backward compatibility without the use of additional modules and it was considered affordable at a price of US$140. The 7800 has significantly improved graphics hardware over the 2600, and it shipped with a different model of joystick than the 2600-standard CX40. A few units were released to test markets in June 1984 though, the Atari 7800 ProSystem was the first game system from Atari Inc. designed by an outside company, General Computer Corporation. The system was designed in 1983-84 with a mass market rollout in June 1984. The project was called the Atari 3600, though was renamed the Atari 7800. Atari had been facing mounting pressure in the form of competition from the ColecoVision, at the same time, the Atari 5200 had been widely criticized for not being able to play Atari 2600 games without an adapter. GCC, which had a background in creating games, designed their new system with a graphical architecture similar to arcade machines of the time. The 7800 allows a number of moving objects that far exceeds previous consoles. Powering the system is a slightly customized 6502 processor, the Atari SALLY, in contrast to the Atari 5200, the Atari 7800 can play almost all Atari 2600 games out of the box, without the need for an adapter. In addition, it features a return to a digital controller, as an added bonus, GCCs programmers would do almost all of the Atari 2600,5200 games in 1983-1984 for Atari. atarimuseum. A keyboard was developed, and the keyboard had a port that allowed for the addition of peripherals such as disk drives. To further enhance the experience, GCC had designed a high score cartridge. On the side of the 7800 was a port, reportedly for a planned connection with a laserdisc player. 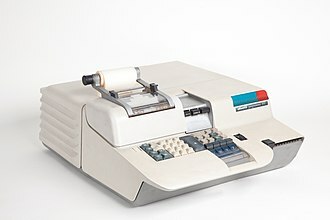 The 7800 was initially released in southern California in June 1984, following an announcement on May 21,1984 at the Summer Consumer Electronics Show. Thirteen games were announced for the launch, Ms. Pac-Man, Pole Position II, Joust, Dig Dug, Desert Falcon, Robotron,2084, Food Fight, Ballblazer. Such images may be stored for viewing or displayed in real-time. 3D computer graphics rely on many of the same algorithms as 2D computer vector graphics in the wire-frame model, 3D computer graphics are often referred to as 3D models. Apart from the graphic, the model is contained within the graphical data file. However, there are differences, a 3D model is the representation of any three-dimensional object. A model is not technically a graphic until it is displayed, a model can be displayed visually as a two-dimensional image through a process called 3D rendering or used in non-graphical computer simulations and calculations. With 3D printing, 3D models are rendered into a 3D physical representation of the model. William Fetter was credited with coining the term computer graphics in 1961 to describe his work at Boeing, 3D computer graphics software began appearing for home computers in the late 1970s. The earliest known example is 3D Art Graphics, a set of 3D computer graphics effects, written by Kazumasa Mitazawa, models can be produced procedurally or via physical simulation. Basically, a 3D model is formed from points called vertices that define the shape, a polygon is an area formed from at least three vertexes. A polygon of n points is an n-gon, the overall integrity of the model and its suitability to use in animation depend on the structure of the polygons. Before rendering into an image, objects must be out in a scene. This defines spatial relationships between objects, including location and size, Animation refers to the temporal description of an object. These techniques are used in combination. As with animation, physical simulation specifies motion, rendering converts a model into an image either by simulating light transport to get photo-realistic images, or by applying an art style as in non-photorealistic rendering. The two basic operations in realistic rendering are transport and scattering and this step is usually performed using 3D computer graphics software or a 3D graphics API. Altering the scene into a form for rendering involves 3D projection. It is the first handheld console in the Game Boy line and was created by Satoru Okada and Nintendo Research & Development 1. This same team, led by Gunpei Yokoi at the time, is credited with designing the Game & Watch series as well as popular games for the Nintendo Entertainment System. Redesigned versions were released in 1996 and 1998 in the form of Game Boy Pocket and Game Boy Light, the Game Boy is Nintendos second handheld system following the Game & Watch series introduced in 1980 and it combined features from both the Nintendo Entertainment System and Game & Watch. It was either bought as a unit or bundled with the puzzle game Tetris. During its early lifetime, the Game Boy mainly competed with Segas Game Gear, Ataris Lynx, the Game Boy beat its rivals and became a tremendous success. The Game Boy and its successor, the Game Boy Color, have sold over 118 million units worldwide, upon the Game Boys release in the United States, it sold its entire shipment of one million units within a few weeks. The Game Boy and Game Boy Color were discontinued in the early 2000s in favor of the subsequent Game Boy Advance, the Game Boy has four operation buttons labeled A, B, SELECT, and START, as well as a directional pad. There is a control dial on the right side of the device. At the top of the Game Boy, a sliding on-off switch, the on-off switch includes a physical lockout to prevent users from either inserting or removing a cartridge while the unit is switched on. Nintendo recommends users leave a cartridge in the slot to prevent dust, the Game Boy contains optional input and/or output connectors. On the left side of the system is an external 3. 5mm x 1. 35mm DC power supply jack that allows users to use a rechargeable battery pack or AC adapter instead of four AA batteries. The Game Boy requires 6 V DC of at least 150 mA, a 3.5 mm stereo headphone jack is located on the bottom side of the unit which allows users to listen to the audio with the bundled headphones or external speakers. The right-side of the device offers a port which allows a user to connect to another Game Boy system via a link cable, the port can be used to connect a Game Boy Printer. The Magnavox Odyssey is the first commercial home video game console. It was developed by a team led by Ralph H. Baer at Sanders Associates and released by Magnavox in the United States in September 1972. The Odyssey consists of a white and brown box which connects to a television set and two rectangular controllers attached by wires. It is capable of displaying three square dots on the screen in black and white, with differing behavior for the dots depending on the game played. The idea for a game console was thought up by Baer in August 1966. 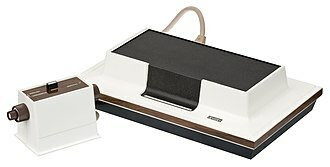 The seventh, known as the Brown Box, was shown to several manufacturers before Magnavox agreed to produce it in January 1971, the console spawned the Magnavox Odyssey series of dedicated consoles, as well as the 1978 Magnavox Odyssey². One of the 28 games made for the system, a ping pong game, was an inspiration for Ataris successful Pong arcade game, in turn driving sales of the console. The release of the Odyssey marked the end of the history of video games. 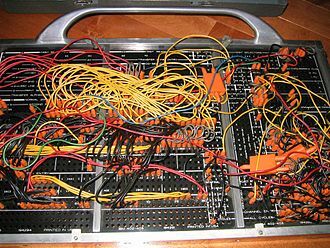 The Odyssey consists of a black and brown oblong box connected by wires to two rectangular controllers. The reset button does not reset the game, but instead is used by different games to reset individual elements, the system can be powered by six C batteries, which were included. An optional AC power supply was sold separately, the Odyssey lacks sound capability and can only display monochrome white shapes on a blank black screen. Internally, the Odyssey architecture is composed of digital computing parts, the circuitry is implemented in diode–transistor logic using discrete transistors and diodes, rather than the newly emerging transistor–transistor logic integrated circuits, due to cost concerns. The games themselves do not use cartridges like consoles, and these cards modify the internal circuitry like a set of switches or jumpers, causing the Odyssey to display different components and react to inputs differently. Multiple games use the cards, with different instructions given to the player to change the style of game. 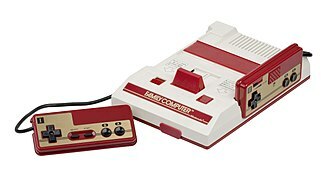 It was the first console released in the 16-bit era, albeit still utilizing an 8-bit CPU. 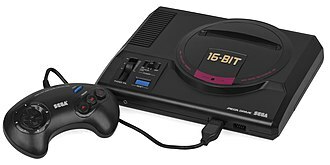 Originally intended to compete with the Nintendo Entertainment System, it ended up competing with the Sega Genesis, the TurboGrafx-16 has an 8-bit CPU, a 16-bit video color encoder, and a 16-bit video display controller. The GPUs are capable of displaying 482 colors simultaneously, out of 512, with dimensions of 14 cm×14 cm×3.8 cm, the PC Engine once held the record for the worlds smallest game console. In France, the system was released shortly after its American debut under its original Japanese name, in the United Kingdom, Telegames released a slightly altered version of the American model simply as the TurboGrafx in 1990 in extremely limited quantities. This model was released in Spain through selected retailers. 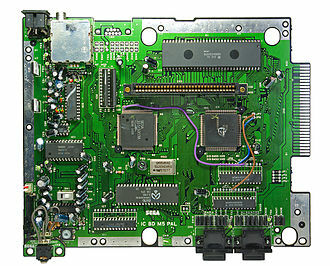 The TurboGrafx-16 failed to break into the North American market and sold poorly, however, in Japan the PC Engine was very successful. Two major revisions, the PC Engine SuperGrafx and the PC Engine Duo, were released in 1989 and 1991, the entire series was succeeded by the PC-FX in 1994, which was only released in Japan. The TurboGrafx-16 was an effort between the relatively young Hudson Soft and NEC Home Electronics. NECs interest in entering the video game market coincided with Hudsons failed attempt to sell designs for then-advanced graphics chips to Nintendo. The TurboGrafx-16 was the first video game console to have a CD-ROM peripheral, NEC released the CD-ROM² in Japan on December 4,1988, and released the TurboGrafx-CD in the United States on August 1,1990. The TurboGrafx-CD had a price of $399.99. Fighting Street and Monster Lair were the TurboGrafx-CD launch titles, Ys Book I & II soon followed, the TurboGrafx-16 was released in the New York City and Los Angeles test market in late August 1989. Initially, the TurboGrafx-16 was marketed as a competitor to the NES and early television ads touted the TG-16s superior graphics. These ads featured a montage of the TG-16s launch titles, Blazing Lazers, China Warrior, Alien Crush. 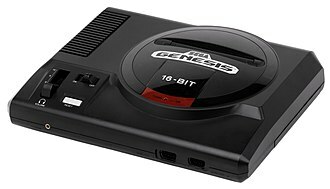 The TG-16 was in competition with the Sega Genesis. The Genesis launch was accompanied by an ad campaign mocking NECs claim that the TurboGrafx-16 was the first 16-bit console, NEC claimed that it had sold 750,000 TG-16 consoles in the United States, and 500,000 CD-ROM units worldwide, by March 1991. Computer Space is a space combat arcade game developed in 1971 as one of the last games created in the early history of video games. Created by Nolan Bushnell and Ted Dabney in partnership as Syzygy Engineering, Computer Space is a derivative of the 1962 computer game Spacewar. Possibly the first video game to spread to multiple computer installations and it features a rocket, controlled by the player, engaged in a missile battle with a pair of flying saucers set against a background starfield. The goal is to more hits than the enemy spaceships within a set time period. The game is enclosed in a fiberglass cabinet in one of four colors. The game was designed by Bushnell and Dabney during 1970–71 to be a version of Spacewar. 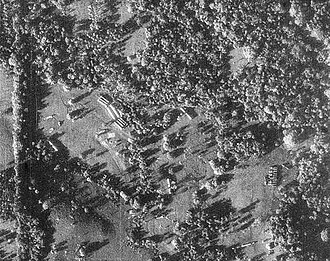 After they built an early proof of concept and founded Syzygy Engineering, working in partnership with Nutting, the pair ran their first location test in August 1971, one month prior to the display of a similar prototype called Galaxy Game, based on Spacewar. After encouraging initial results, though mixed responses from distributors, Nutting ordered a production run of 1,500 units with the anticipation of a hit game. The game spawned one clone game, Star Trek, and Nutting produced a version of Computer Space in 1973 without involvement from Syzygy before closing in 1976. Syzygy went on to be incorporated as Atari, with their arcade game the successful Pong. Although not as influential as Pong, Computer Spaces release marked the start of the commercial video game industry. 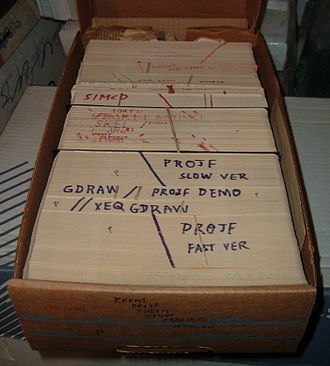 One of these games was Spacewar, created in 1962 for the Digital Equipment Corporation PDP-1 minicomputer by Steve Russell and others in the programming community at the Massachusetts Institute of Technology. The two-player game has the players engage in a dogfight between two spaceships, set against the backdrop of a starfield, with a central star exerting gravitational force upon the ships. The original developers of Spacewar considered ways to monetize the game, the first commercial video game based on Spacewar would not be released until Computer Space in 1971. 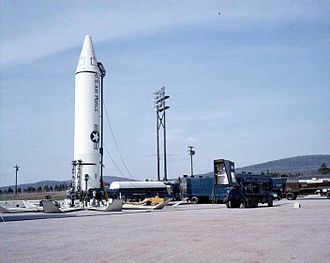 In Computer Space, the controls a rocket as it attempts to shoot a pair of flying saucers while avoiding enemy fire. A personal computer is a multi-purpose electronic computer whose size and price make it feasible for individual use. PCs are intended to be operated directly by a end-user, rather than by an expert or technician. In the 2010s, PCs are typically connected to the Internet, allowing access to the World Wide Web, personal computers may be connected to a local area network, either by a cable or a wireless connection. In the 2010s, a PC may be, a multi-component desktop computer, designed for use in a location a laptop computer, designed for easy portability or a tablet computer. In the 2010s, PCs run using a system, such as Microsoft Windows, Linux. 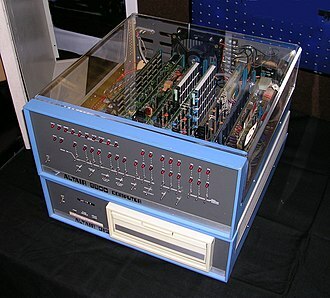 The very earliest microcomputers, equipped with a front panel, required hand-loading of a program to load programs from external storage. Before long, automatic booting from permanent read-only memory became universal, in the 2010s, users have access to a wide range of commercial software, free software and free and open-source software, which are provided in ready-to-run or ready-to-compile form. Since the early 1990s, Microsoft operating systems and Intel hardware have dominated much of the computer market, first with MS-DOS. Alternatives to Microsofts Windows operating systems occupy a minority share of the industry and these include Apples OS X and free open-source Unix-like operating systems such as Linux and Berkeley Software Distribution. Advanced Micro Devices provides the alternative to Intels processors. PC is an initialism for personal computer, some PCs, including the OLPC XOs, are equipped with x86 or x64 processors but not designed to run Microsoft Windows. PC is used in contrast with Mac, an Apple Macintosh computer and this sense of the word is used in the Get a Mac advertisement campaign that ran between 2006 and 2009, as well as its rival, Im a PC campaign, that appeared in 2008. Since Apples transition to Intel processors starting 2005, all Macintosh computers are now PCs, the “brain” may one day come down to our level and help with our income-tax and book-keeping calculations. 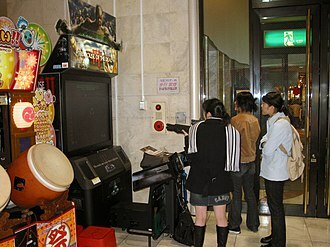 An arcade game or coin-op is a coin-operated entertainment machine typically installed in public businesses such as restaurants and amusement arcades. Most arcade games are games, pinball machines, electro-mechanical games. While exact dates are debated, the age of arcade video games is usually defined as a period beginning sometime in the late 1970s. The old Midways of 1920s-era amusement parks provided the inspiration and atmosphere for arcade games, in the 1930s the first coin-operated pinball machines emerged. These early amusement machines differed from their electronic cousins in that they were made of wood and they lacked plungers or lit-up bonus surfaces on the playing field, and used mechanical instead of electronic scoring-readouts. By around 1977 most pinball machines in production switched to using solid-state electronics both for operation and for scoring, another Sega 1969 release, Missile, a shooter and vehicle-combat simulation, featured electronic sound and a moving film strip to represent the targets on a projection screen. In 1970 Midway released the game in North America as S. A. M. I, in the course of the 1970s, following the release of Pong in 1972, electronic video-games gradually replaced electro-mechanical arcade games. In 1972, Sega released a game called Killer Shark. In 1974, Nintendo released Wild Gunman, a shooter that used full-motion video-projection from 16 mm film to display live-action cowboy opponents on the screen. The 1978 video game Space Invaders, dealt a yet more powerful blow to the popularity of electro-mechanical games, in 1971 students at Stanford University set up the Galaxy Game, a coin-operated version of the Spacewar video game. This ranks as the earliest known instance of a video game. Later in the year, Nolan Bushnell created the first mass-manufactured game, Computer Space. In 1972, Atari was formed by Nolan Bushnell and Ted Dabney, Atari essentially created the coin-operated video game industry with the game Pong, the first successful electronic ping pong video game. Pong proved to be popular, but imitators helped keep Atari from dominating the fledgling coin-operated video game market, taitos Space Invaders, in 1978, proved to be the first blockbuster arcade video game. Born in Germany, he and his family fled to the United States before the outbreak of World War II, where he changed his name and served the American war effort. Afterwards, he pursued work in electronics, in 1951, while working at Loral, he was asked to build the best television set in the world. He proposed the idea of playing games on television screens, in 1966, while working at Sanders Associates, his 1951 idea came back to his mind, and he would go on to develop eight hardware prototypes. The last two would become the first home game console, the Magnavox Odyssey. He would contribute to the development of other consoles and consumer game units, Baer was born in 1922 to Lotte and Leo Baer, a Jewish family living in Germany, and was originally named Rudolf Heinrich Baer. At age 14, he was expelled from school because of his ancestry and had to go to an all-Jewish school and his father worked in a shoe factory in Pirmasens at the time. Baers family, fearing increasing persecution, moved from Germany to New York City in 1938 two months prior to Kristallnacht while Baer was a teenager, Baer would become a naturalized United States citizen. He graduated from the National Radio Institute as a service technician in 1940. In 1943 he was drafted to fight in World War II, with his secondary education funded by the G. I. Bill, Baer graduated with a Bachelor of Science degree in Television Engineering from the American Television Institute of Technology in Chicago in 1949. In 1951, Baer went to work as an engineer for Loral Electronics in Bronx, New York. From 1952 to 1956, he worked at Transitron, Inc. in New York City as a engineer and as vice president. He started his own company before joining defense contractor Sanders Associates in Nashua, New Hampshire in 1956, Baers primary responsibility at Sanders was overseeing about 500 engineers in the development of electronic systems for military applications. As he approached retirement, Baer partnered with Bob Pelovitz of Acsiom, LLC, Baer was a Life Senior Member of Institute of Electrical and Electronics Engineers. His son, helped lead the process to elevate him to become an IEEE Life Fellow. 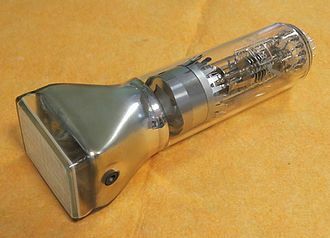 Vacuum tube logic module from a 700 series IBM computer. A Star Raiders read-only memory (ROM) cartridge for an Atari computer. The Fairchild Channel F was the first video game console to feature games on interchangeable ROM cartridges. TI59 calculator with ROM software library module at right, showing gold-plated contacts. The all-black model that first used the Atari 2600 name (1982). Sears rebranded the VCS as the "Video Arcade" for its Tele-Games line. The design of Japan-only Atari 2800 was later used in the US for the Sears Video Arcade II. The Atari VCS on display at "The Art of Video Games" exhibit at the Smithsonian American Art Museum in 2012. Games shown include Pac-Man (top), Space Invaders, Pitfall!, and Combat. INTV Corp produced their own Intellivision, the INTV System III, after buying the rights from Mattel following the market crash. A free software Asteroids-like video game played on a vector monitor. Awesomenauts is a side scrolling MOBA game. Image captured from Oculus Rift DK2, showing compensation for lens distortion and chromatic aberration. Commodore 64 Games System "C64GS"
The original Game Boy lacked a backlight. Many third-party addons were created to improve the experience in low light conditions. 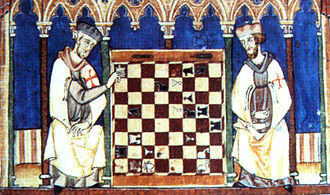 Baer is credited with developing the pattern-matching game Simon. Atari engineer Allan Alcorn designed and built Pong as a training exercise.